Thanks to Gill, WCN got the heads-up that the King County Sheriff’s Office storefront is currently in great need of graffiti-paintout supplies — in particular, outdoor primer. Unlike the city of Seattle, which has a graffiti program, unincorporated areas like White Center must rely on donated materials. 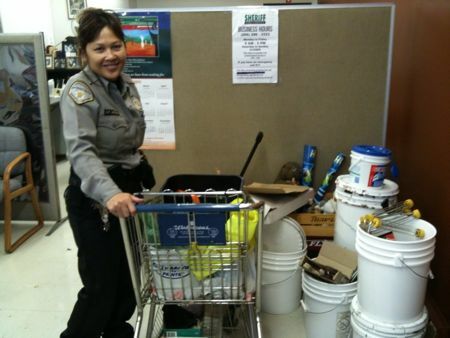 On Wednesday, the city of Seattle donated about 15 gallons of paint, some brushes and rollers to the “quality of life” program, which Community Service Officer Vary Jackson (top photo) helps coordinate. 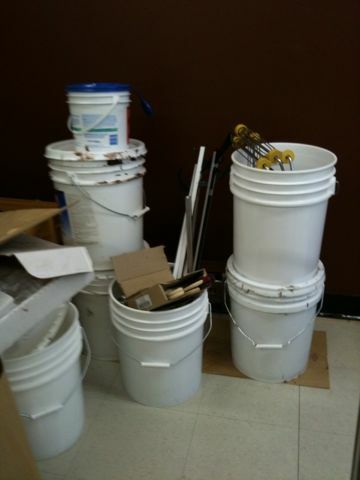 But Officer Jackson told WCN that they still are in dire need of outdoor-only primer. The “quality of life” program deploys misdemeanor offenders to address such issues as cleaning up graffiti vandalism, retrieving abandoned shopping carts, and picking up litter. Officer Jackson says that the brief snow we had a few weeks ago seemed to encourage a lot of tagging around the neighborhood, though she emphasized that this was mostly tagger-style graffiti rather than gang-turf-war-type markings. Even so, there is just so much of it since then, that they have used up the outdoor primer they had. Go, Vary and crew, go! Glad to see Vary has some of what she needs to take care of graffiti south of Roxbury. 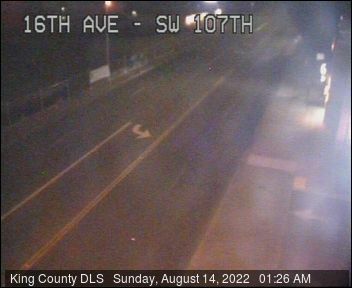 To bad Seattle didn’t use some of that paint to take care of the heavily graffitied closed service station at SW Barton/Delridge Way SW. It was still there as of yesterday afternoon.